TechHive Fall 2017: Day 10 // Showcase Day! Today was the final day of our Fall 2017 TechHive Internship cohort! We always like to end with a final show case on the museum floor for visitors to interact with our projects and learn about the work we do in TechHive. This provides a fun experience for our visitors and allows us to get user feedback for our next iteration on the project. This was a completely brand new project for us so it was important for us to understand how to improve this project for the next cohort. First, our interns focused on the final touches to their ARduino Box (augmented reality with an arduino in a box.) Each has many mechanisms using LEDs, servos, and even a fog machine! The "juice" and aesthetics of their projects was also important as they had to take into consideration the ages of visitors in the Lawrence Hall of Science. Besides the aesthetics and mechanisms, the interns also had to wire up everything to their bread board. They had created an app on MITAppInventor that would control everything inside the box via Bluetooth to the arduino. We also had to set up the Raspberry Pi camera inside of the box that would stream to an Android or Apple phone. The camera image would split into two separate images which would create the stereoscopic view when placed inside the Google Cardboard head set. This would create the "augmented reality" experience that we were working towards. One of our volunteers helped set up the base of the camera so that each team could place thier completed box on top of. This allowed us to quickly switch boxes and take turns setting up. Along with the actual ARduino Box and camera, we had push buttons to control the direction that the camera rotated. This could allow one person to wear the headset while another one controlled the push buttons or the accompanying app to control what was inside the box. We also streamed video to an external screen so that anyone not wearing the headset (or those that get motion sickness) could see what was going on. 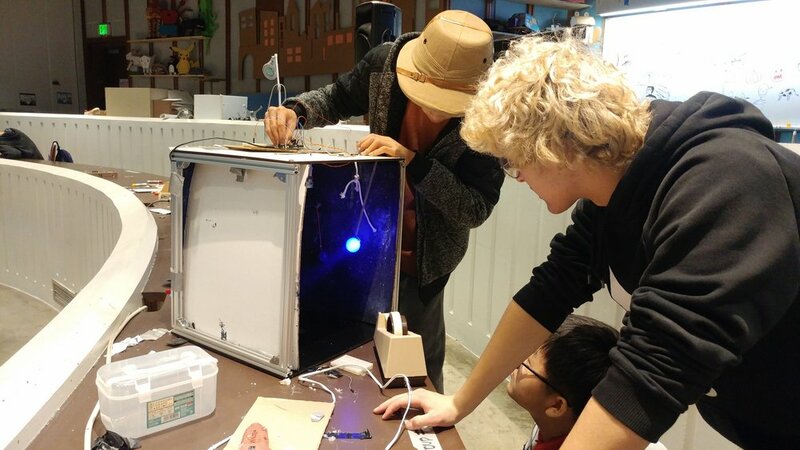 Once our interns set up their ARduino Box, we invited visitors to try out our mini-exhibit! 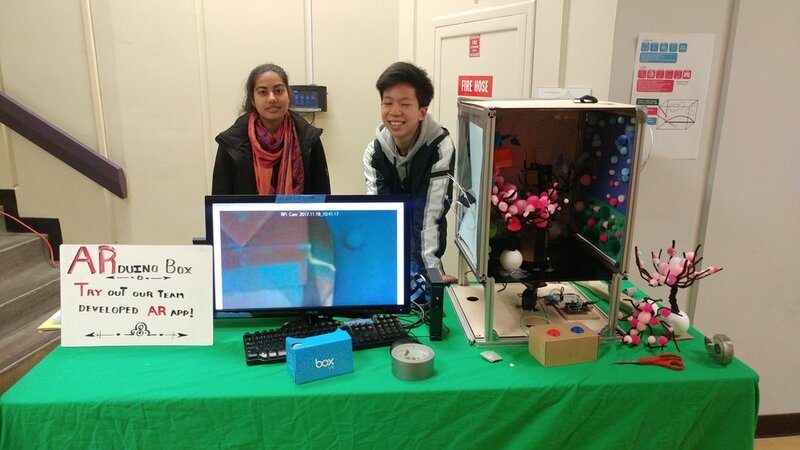 The pushbuttons that controlled the Raspberry Pi camera and the box itself were colorful and appealing which made everyone want to interact with it. Using a phone inside a Google Cardboard headset also made it very accessible and not intimidating for our youngest visitors. All of the interns and volunteers did a great job explaining to young visitors and their parents how to use the headset while also demonstrating the mechanics of their team's project. Visitors enjoyed hearing about how our high school interns worked on creating an interactive project for the Lawrence Hall of Science. Overall, this was our first official showcase of the ARduino project. We learned a lot over the last 10 weeks and felt like the project had a successful first run. Thank you to all of our hard working, professional, and amazing junior interns, senior interns, volunteers, and staff for a great Fall 2017 cohort! Pictured (left to right, top to bottom): Preston Akubuo-Onwuemeka (Intern), Dominic Dighera (Volunteer), Emanuel Gordis (Intern), Kobe Tran (Intern), Eirren Viray (Intern), Maxim Yu (Intern), Edgar Oseguera (Intern), Steven Mo (Intern), Ana Sophia Jed (Senior Lead Intern), Matan Maoz (Intern), Jenna Liu (Intern), Emily Lu (Intern), Aesha Parekh (Intern), Jessie Yang (Intern), Catherine Zhao (Intern), Jennifer Garcia (Intern), Yasmine Padilla (Intern), Madeeha Khan (Senior Lead Intern), Annette Tran (Intern), Yasmine Aguirre (Intern), Karthika Thiruvallur (Intern), Ally Lee (Senior Lead Intern), Ariel Ortiz (Manager and Lead Facilitator), Dora Medrano (Coordinator and Co-Facilitator).